With a lack of adequate hardscape tools in Revit, many firms and individuals have taken to modeling hardscape with a variety of other families. Two of the most popular hardscape alternatives are Floors and Roofs. They are quite similar in their structure and they can both be modified by sub-elements. When I was first introduced to the concept of modifying sub-elements it was actually via a Roof. As I have seen the topic discussed and presented, it seems like Roofs are quite popular among architects and structural engineers, perhaps because they are more familiar with shape-editing Roofs. But after using both Floors and Roofs for hardscape, I have found Floors to be the better option. Then the sub-element elevations on the Roof are no longer correct. This is fine if you anticipate this with your workflow, but for most landscape workflows, you want those sub-elements to stay at their specified elevations. 2. Floors can host Level-based families (Roofs cannot). 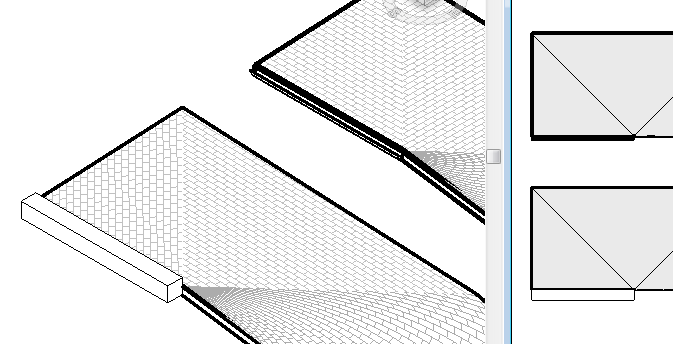 This is something that I did not realize until quite recently, and it is the biggest deal-breaker for using Roofs. I need to be able to host level-base site families onto hardscape. 3. 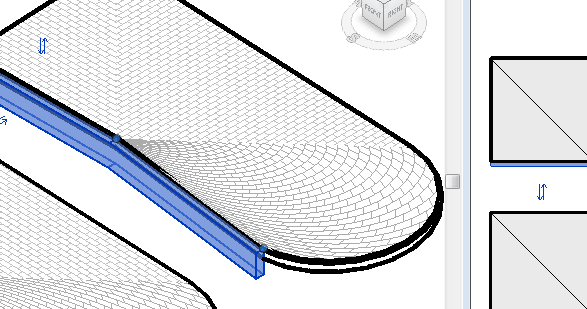 Fascia does not work on curved, sloping edges. One of the biggest reasons people seem to use Roofs is because they can create curbs with Fascia (or Gutters). But if you have a curved, sloping edge Fascia doesn’t work. Neither Fascia, Gutters, nor Slab Edges can be created along curved, sloping edges of either Roofs or Floors. I have heard of firms using Fascia to create curbs, but I guess they do not have curved and sloped edges(?). Fascia can be created along a sloped straight edge (unlike Gutters or Slab Edges which cannot exist along slopes). If you want to create a curb along a sloped, curved edge you can create an In-Place Curb. 4. Categorically, Floors make more sense. This may seem like a little thing, but it is important for your model to be understandable and accessible across multiple users. And when taken with the first three points, I see very little reason to use Roofs for hardscape. But that is just my opinion. Do you have other reasons for using Floors or even Roofs? Floors have the ‘Function’ parameter toggle to be ‘Interior’ or ‘Exterior’ so it seems like the idea of using external floors as hardscape is what Autodesk have in mind. I have a complex wharped Floor (one that has had its sub elements lifted up or pushed down). If a 600×600 surface pattern is applied to the floor material, the resulting pattern is also wharped. Do you know how to have the regular pattern shown? My workaround is to create a duplicate flat Floor and only show the flat one in plan… Not ideal I know, but as far as I know there is no way to “override” the pattern of a shape edited floor. The pattern just does not drape. And for your post on RevitForum. Hi Lauren, thanks for your informative blogs. 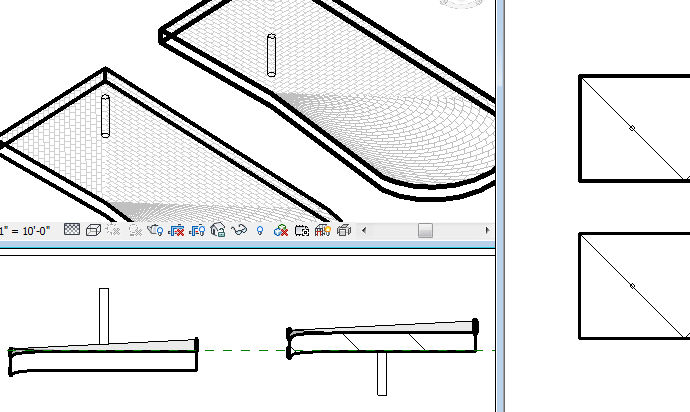 I’m new to Revit and like all the other landscape architects finding it is not an easy relationship. So far, to get around the pattern problem, I’ve been duplicating views specifically for ‘Sheet’. And in these views, I’ve used ‘Fill Region’ to mask the floor. Should the layout changes in the future, it is some what painless to copy and paste revised floor boundaries into ‘Fill Region’ to regenerate them. Would you see any issues using this method? The only issue I would anticipate with this method is that Filled Regions are a detail item, and thus they are view-specific. So, if you wanted to see the hatch pattern in multiple views, you would have an issue. You could work around that by putting the Filled Regions in a Detail Group. There are further issues you could encounter by doing this- mainly if you anticipate a larger team working on this project, Detail Groups can cause worksharing issues. But if this is a small project and you only need hatch patterns in a limited number of views, then Filled Regions might work just fine.